ZOTAC introduces MAGNUS EN10 Series gaming mini PCs powered by new NVIDIA Pascal Architecture-based graphics processors. GTX 1060 and 1070. 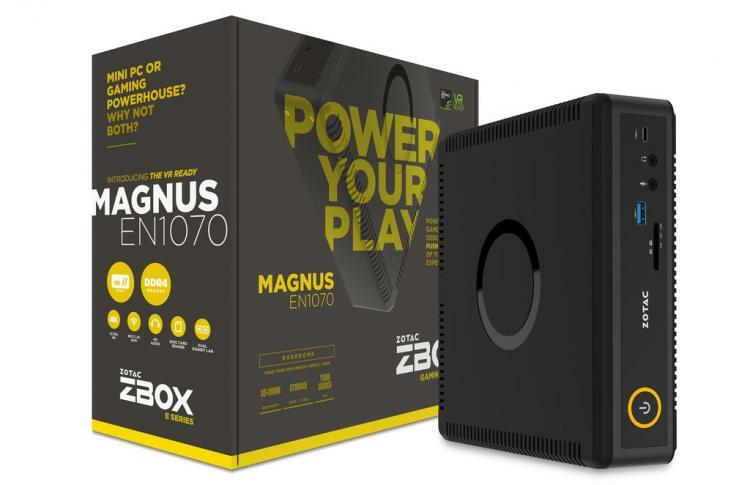 The ZBOX MAGNUS EN10 Series will also be powered by a 6th generation Core Intel processor, a Skylake i5-6400T, and with DDR4 memory upgradable of up to 32GB. The MAGNUS Series mini PCs will bring forth a powerful and capable system for premium entertainment and high-end gaming in such a small size. The new MAGNUS EN10 Series will also feature native 4K resolution support at 60hz and can also support up to four displays. It will also have the standard DisplayPort 1.3 and HDMI 2.0 ports. Both models will have 2 x HDMI 2.0 and 2 x DisplayPort 1.3 video output. The ZBOX MAGNUS EN10 Series are also VR Ready and NVIDIA G-Sync Ready. The MAGNUS mini PCs also supports a PCIe x4 M.2 SSD. For connectivity, the MAGNUS EN10 Series uses dual gigabit LAN support and a speedy 802.11ac WiFi connection. It also uses both USB 3.1 Type-C and Type-A ports to support all the newer technologies and devices today. The MAGNUS mini PC has a dimension of 8.27 x 7.99 x 2.45 inches (L x W x H). Both the EN1060 and EN1070 will come in as either barebones, with Windows 10 or as PLUS. See all the MAGNUS EN10 Series mini PC models here.